Burnley won for the first time in seven Championship games as midfielder Scott Arfield scored twice in a 4-0 home win over struggling Charlton Athletic. Arfield converted Matt Lowton's cross for Burnley's first goal in 314 minutes of league football and two more came in quick succession after the interval. 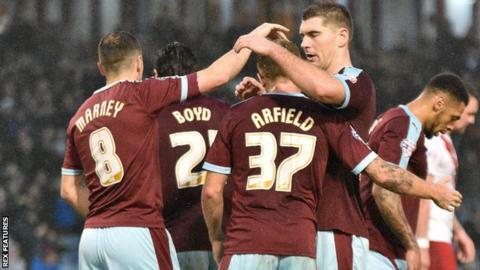 Dean Marney created Arfield's deflected second and George Boyd set up top scorer Andre Gray for the third. Sam Vokes sealed an emphatic Burnley win, turning in another Lowton cross. Charlton are now without a win in five league games and remain in the relegation zone. Burnley, whose poor run had seen them slip eight points off the automatic promotion places before Saturday's fixtures, were subdued at Turf Moor until Arfield's opener, their first goal since a 2-2 draw at Cardiff on 28 November. Charlton enjoyed the better of the opening stages but Johnnie Jackson's shot, tipped over by Burnley goalkeeper Tom Heaton, was their only effort on target before they fell behind. Clarets striker Gray scored his first goal in five games - and his 12th of the season - while Vokes netted for the first time since 2 October to complete an emphatic win. Burnley manager Sean Dyche: "Scott has got toughness to his character, relentlessness to his character and it served him well. "Yet again, it's the inner belief these lads should have from a season in the Premier League, but it's not an easy season just because we have come down. "You get more growth out of that than you do if it was all easy all the time. It still takes time for teams to mould. "We've had big players leave this football club and we've had to bring what we feel are very good players in. "It's still moulding. It's still forming. Second half I think is as fluid as it has been." Charlton interim head coach Karol Fraeye: "I think we came here not to park the bus. I think we were the best team for 44 minutes and just showed the flow we are in to be 0-0, and even worse to go 1-0 down just before half-time at the worst possible moment. "Then you come out and then the first ball they got goes in for 2-0 and then what happens to our team is what happens to every team in the bottom. "It should not happen, and everybody knows it, but it happens and we don't look so consistent anymore. "We were second best all second half, that's for me the summary of this game. The first goal is of course very important, we went for it, didn't get it." Match ends, Burnley 4, Charlton Athletic 0. Second Half ends, Burnley 4, Charlton Athletic 0. Corner, Burnley. Conceded by Stephen Henderson. Attempt saved. Rouwen Hennings (Burnley) left footed shot from the centre of the box is saved in the centre of the goal. Assisted by Matthew Lowton. Attempt blocked. Matthew Taylor (Burnley) left footed shot from outside the box is blocked. Dean Marney (Burnley) wins a free kick in the attacking half. Foul by Reza Ghoochannejhad (Charlton Athletic). Attempt saved. Johnnie Jackson (Charlton Athletic) left footed shot from outside the box is saved in the bottom left corner. Reza Ghoochannejhad (Charlton Athletic) wins a free kick in the attacking half. Attempt saved. Michael Kightly (Burnley) left footed shot from the left side of the box is saved in the bottom left corner. Assisted by Sam Vokes. Substitution, Burnley. Matthew Taylor replaces George Boyd. Substitution, Burnley. Michael Kightly replaces Scott Arfield. Attempt saved. Reza Ghoochannejhad (Charlton Athletic) left footed shot from outside the box is saved in the bottom right corner. Assisted by Naby Sarr. Jordan Cousins (Charlton Athletic) wins a free kick in the defensive half. Goal! Burnley 4, Charlton Athletic 0. Sam Vokes (Burnley) right footed shot from the centre of the box to the bottom left corner. Assisted by Matthew Lowton. Attempt missed. Sam Vokes (Burnley) header from the centre of the box misses to the left. Assisted by Joey Barton with a cross following a corner. Corner, Burnley. Conceded by Jordan Cousins. Attempt blocked. Scott Arfield (Burnley) right footed shot from outside the box is blocked. Assisted by Ben Mee. Foul by George Boyd (Burnley). Zakarya Bergdich (Charlton Athletic) wins a free kick in the attacking half. Attempt blocked. Dean Marney (Burnley) right footed shot from a difficult angle on the right is blocked. Attempt blocked. Scott Arfield (Burnley) right footed shot from the left side of the box is blocked. Dean Marney (Burnley) wins a free kick on the right wing. Substitution, Charlton Athletic. Naby Sarr replaces Patrick Bauer because of an injury. Delay in match Patrick Bauer (Charlton Athletic) because of an injury. Andre Gray (Burnley) wins a free kick on the left wing. Foul by Patrick Bauer (Charlton Athletic). Substitution, Charlton Athletic. Zakarya Bergdich replaces Alou Diarra. Attempt saved. George Boyd (Burnley) left footed shot from outside the box is saved in the bottom right corner. Assisted by Joey Barton. Corner, Burnley. Conceded by Morgan Fox. Attempt saved. Johnnie Jackson (Charlton Athletic) right footed shot from the left side of the box is saved in the bottom right corner. Assisted by Reza Ghoochannejhad. Attempt blocked. Reza Ghoochannejhad (Charlton Athletic) header from the centre of the box is blocked. Assisted by Morgan Fox with a cross.